The Church Council of Greater Seattle applauds the decision of the Seattle City Council to include in its 2017 budget a $29 million housing bond intended to expand financing for affordable housing in Seattle for 2017 that was proposed by Councilmember Lisa Herbold (District 1, West Seattle & South Park). The bond could be used to build up to 500 new units of affordable housing! On November 16, seven of nine councilmembers voted to approve the budget proposal, which received final approval when the City of Seattle budget passed on November 21. This victory followed after a concerted campaign for affordable homes. On October 25, the Rev. 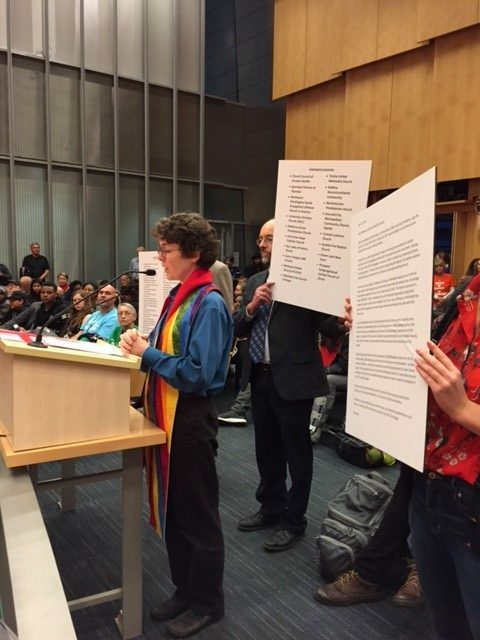 Meighan Pritchard presented our faith letter advocating for 1,000 affordable homes, with 18 congregations and 68 faith leaders signed on, to the City Council. There was much support in the room as well as the overflow room downstairs for our call to action. We followed up with phone calls and visits to council members. While the amendments for 1,000 affordable homes failed, we supported the proposal presented by Councilmember Lisa Herbold with our phone calls, emails, and visits. Thank you to all who signed the letter, made phone calls, sent emails, visited Councilmembers, and gave public testimony. Your advocacy made a difference. Photo courtesy of the Office of Councilmember Kshama Sawant.